High Rejection GPS Timing AntennasThe GPS-TMG-HR-26 timing reference antennas feature a 26 dB amplifier and narrow band high rejection filtering specifically designed to support long-lasting, trouble-free deployments in congested cell-site applications with severe interference around the GPS L1 proprietary quadrifiliar helix design, coupled with multi-stage filtering provides superior out-of-band rejection and lower elevation pattern performance than traditional patch unique radome shape sheds water and ice, while eliminating problems associated with bird perching. The antenna may be purchased by itself or with pipe mounting hardware. Custom models or site kits options are also available. 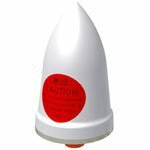 The antenna label and collar mount are color coded red for differentiation antenna is made of materials that fully comply with provisions stipulated by EU directives RoHS 2002/95/EC. If you have any questions about this product by PCTEL Maxrad, contact us by completing and submitting the form below. If you are looking for a specif part number, please include it with your message.